But that's not all I came across. We've all probably wondered about the popular octopoid conundrum of what is the correct plural form of octopus: octopi or octopuses? I sure have, but I've never bothered to look into it. I just always used the one I liked best, which was octopuses. Turns out I was using the right one. At least, according to my trusty New Oxford American Dictionary on my MacBook Pro. You know, that Dictionary application no one knows about. ORIGIN mid 18th cent. : from Greek oktopous (see also Octopoda). USAGE The standard English plural of octopus is octopuses. 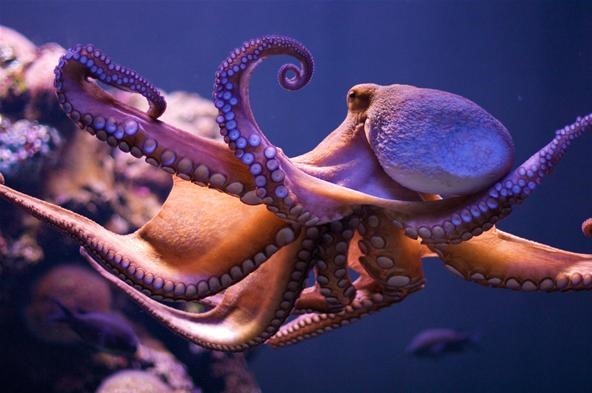 However, the word octopus comes from Greek, and the Greek plural form is octopodes ( |äk'täp??dez|). Modern usage of octopodes is so infrequent that many people mistakenly create the erroneous plural form octopi, formed according to rules for Latin plurals. But then I wondered what variations of the alien-like sea dweller were in the Scrabble Dictionary. Interesting that it does not include the adjective, octopoid. Not that I care, because I've only ever used it in this article. 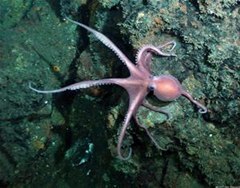 But really, I didn't feel like writing this blog post until I came across a video at Boing Boing, aptly named Great Moments in Pedantry: Octopuses, octopi, octopodes, which was just days after my initial discovery. It's a video (below) of Kory Stamper, an Associate Editor at Merriam-Webster (publisher of the Scrabble Dictionary) talking about the plural version of octopus. It's an old video, but definitely interesting. Mostly because she states that today, all 3 inflections (octopuses, octopi and octopodes) are correct, which would match the what the Scrabble Dictionary tells us. So, I guess my favorite choice was not entirely the right one. But I did find out that people that say "octopi" call us people that say "octopuses" ignorant slobs. I never thought of myself as a slob. Hehehe yeah, I get the "you obviously don't know how to form plurals" look for saying Octopuses. But, my friends, -pus is Greek. Octopi is the "ignorant" version, if we're going to split hairs. My old OED offers only -podes and -puses, while pointing out that "-puses" is anglicized. So I have opted for 'octopodes' because it's the most fun to say. I found that people who say "octopi" call those of us who say "octopuses", ignorant slobs. You cannot start a sentence with but. When speaking about people, you have to use who. People are not things and "that" refers to things. You also don't say us people, you say we, the people etc. So much wrong with our useless education system that it saddens me. Talking to people today is like speaking with 10 year olds. You can most definitely use "but" at the beginning of a sentence. I don't know why people are trying to always say the opposite. I'd also argue that it is perfectly acceptable to use "that" as "who" in certain cases, this being one of them. If you want to make the case that "Talking to people today is like speaking with 10 year olds," then I think you chose a poor example to attack.